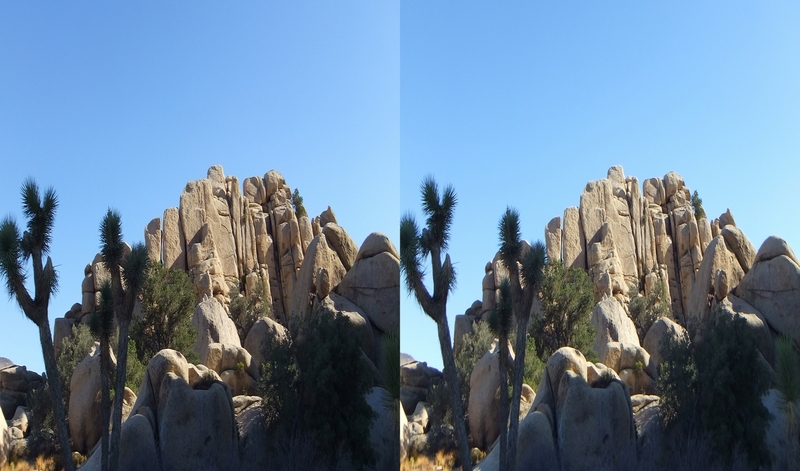 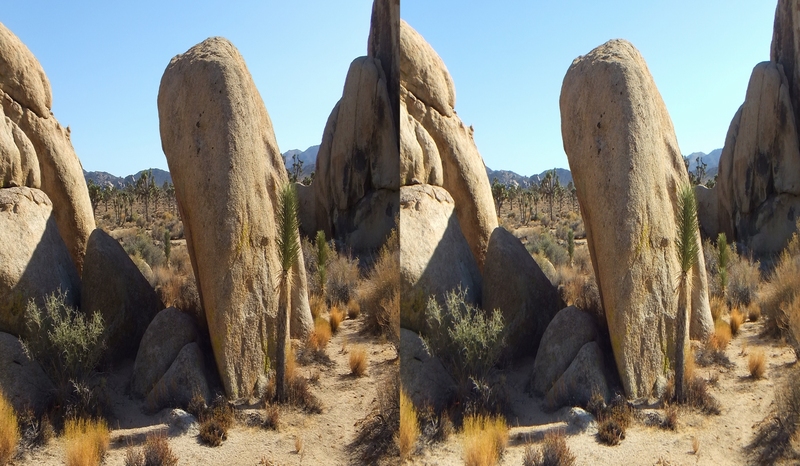 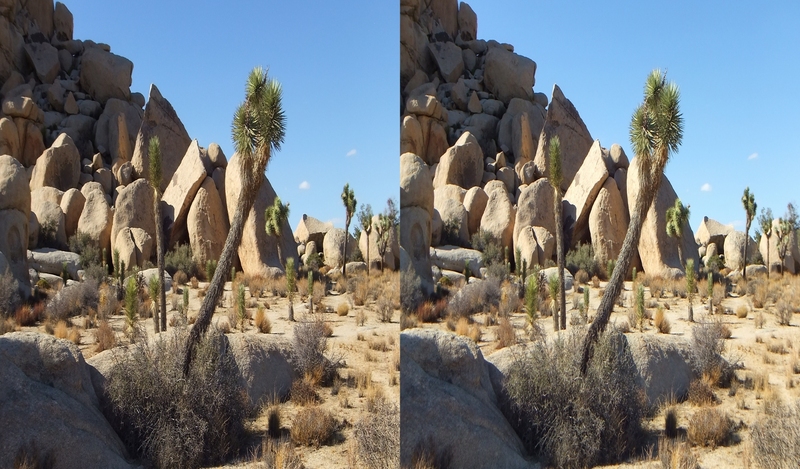 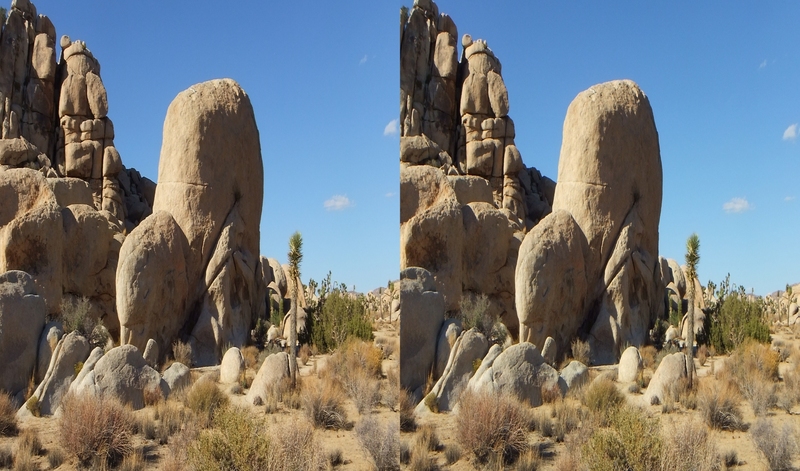 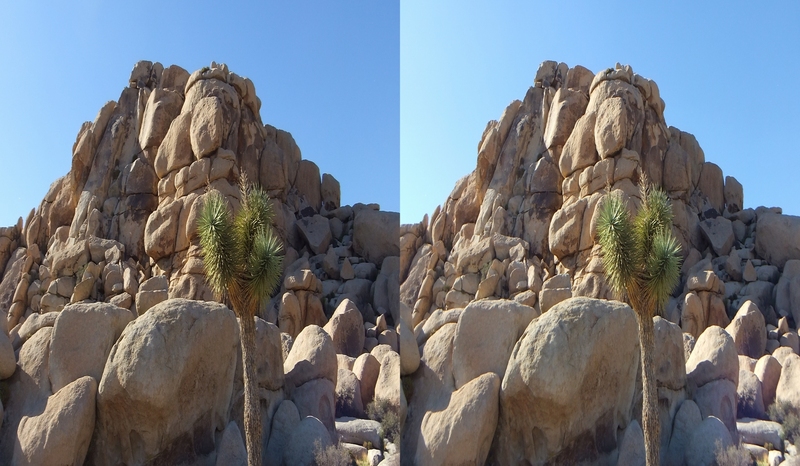 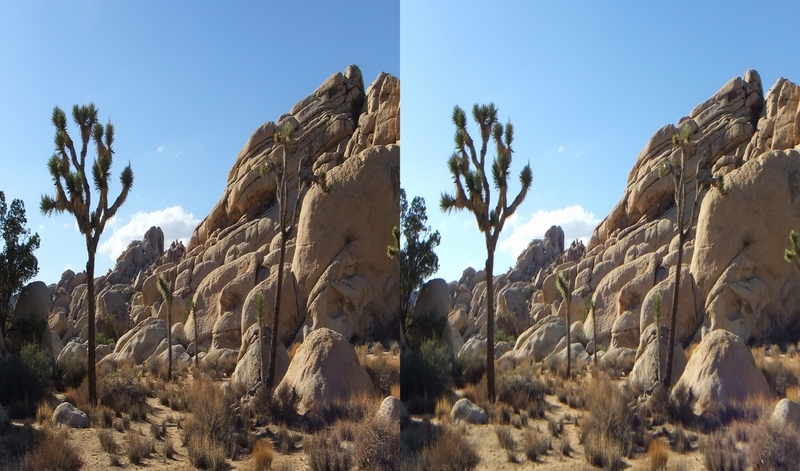 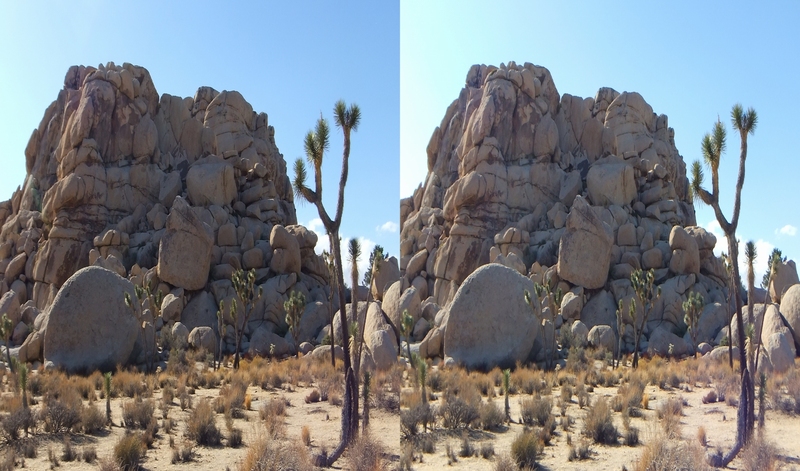 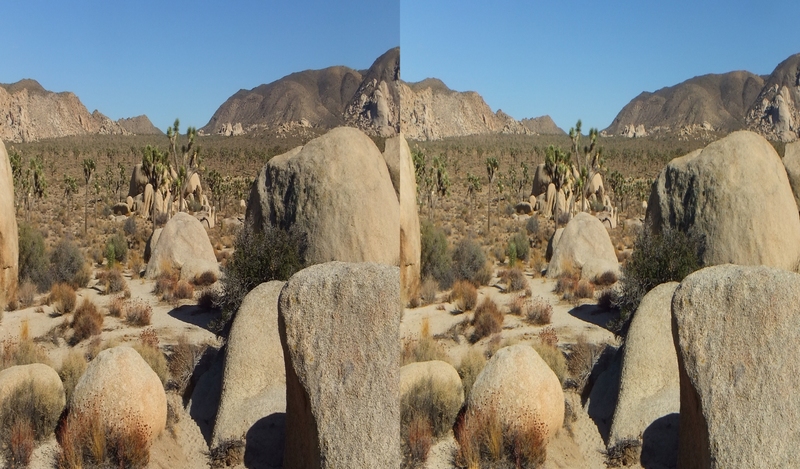 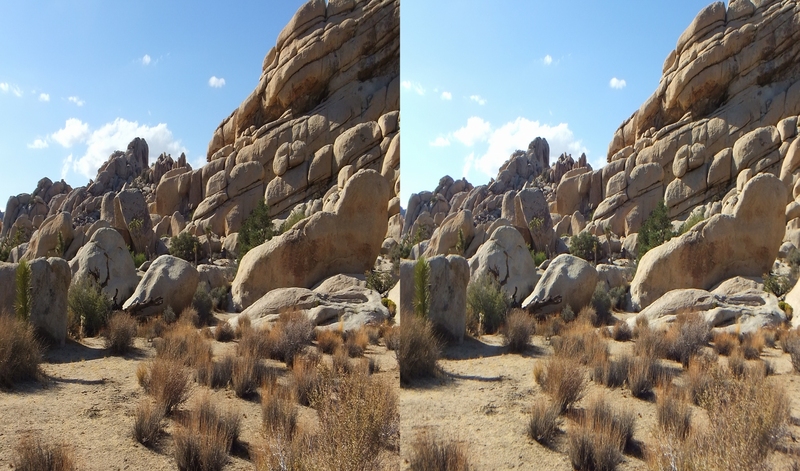 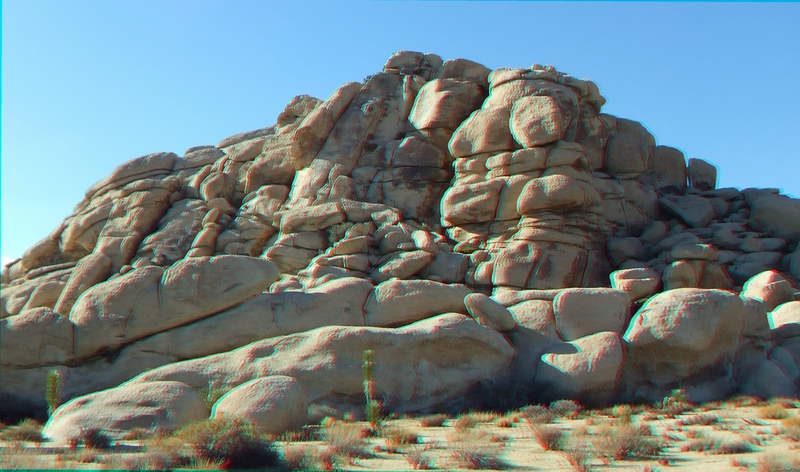 SITUATED AT THE SOUTHERN END of Wonderland of Rocks, the beautiful landscape around Hidden Valley presents the 3D Photographer with extremes of light, seasonal shadow, afternoon color, and weather, play upon and among the rock formations. 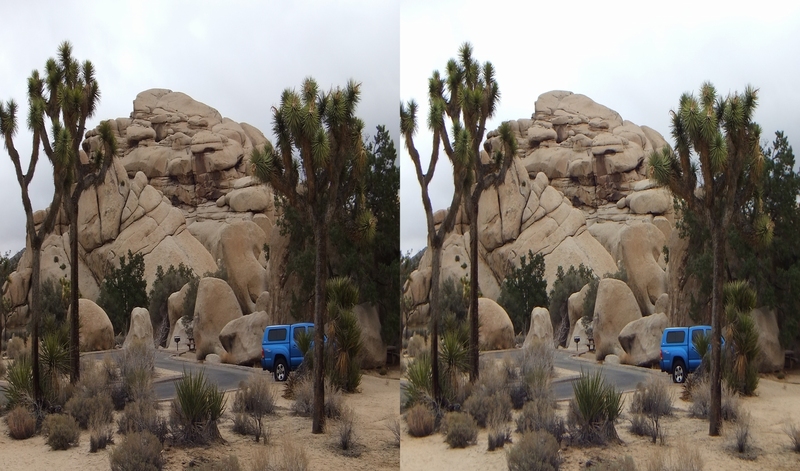 Because of Hidden Valley’s varied attractions, I decided to separate this area into several Galleries. 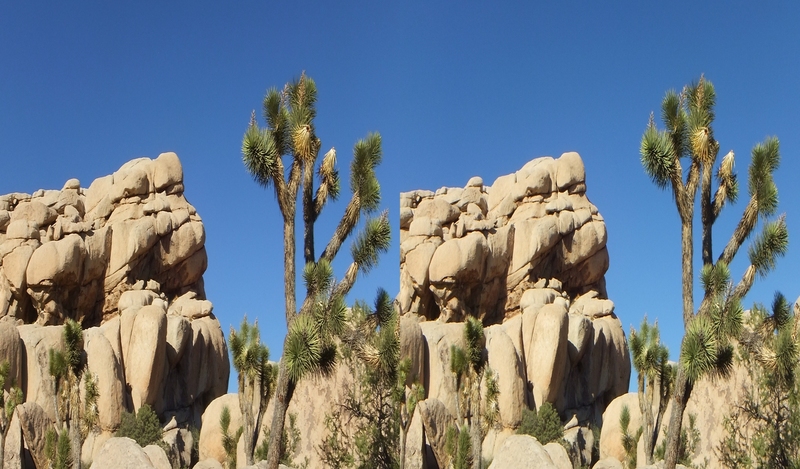 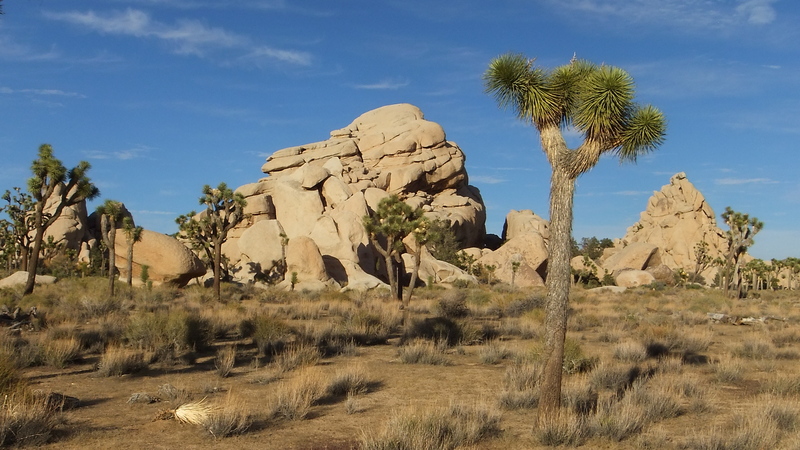 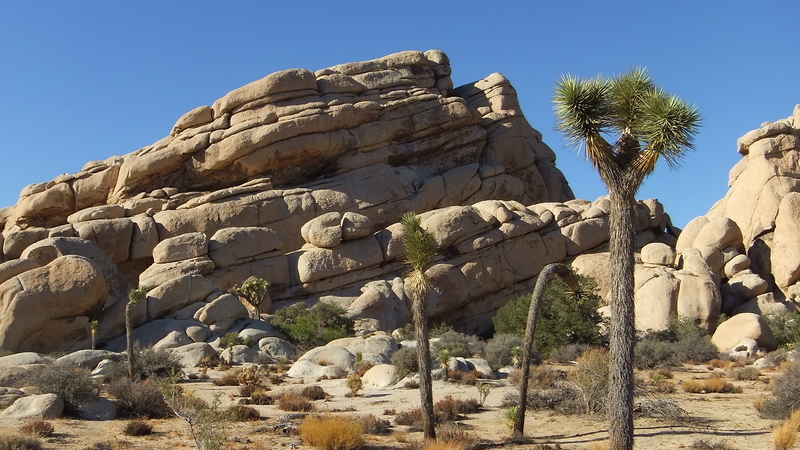 What rock-climbers call the “Real Hidden Valley”—but the Park Service and the visitors refer to simply as “Hidden Valley”—is the Main Attraction. 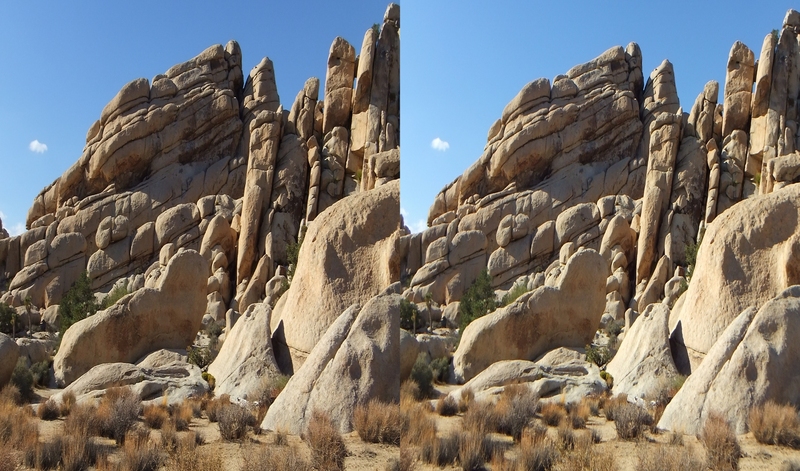 To the west lies an area sometimes mistaken for “Hidden Valley” and referred to in the rock-climbing guides as “Lost Horse Area,” which has a separate Gallery link. 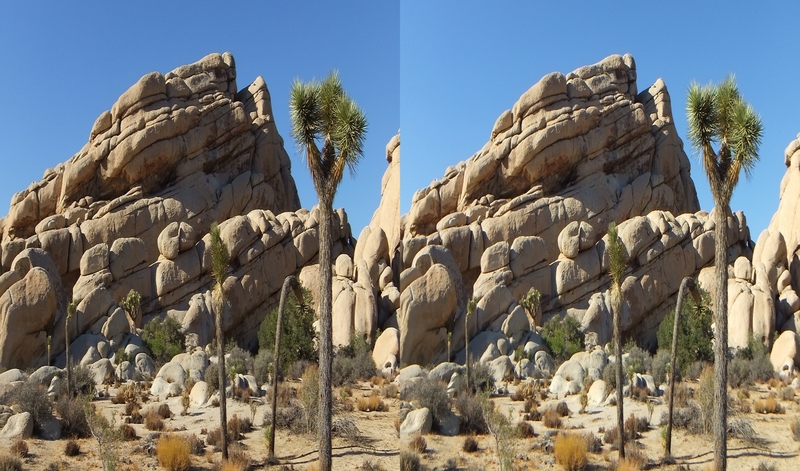 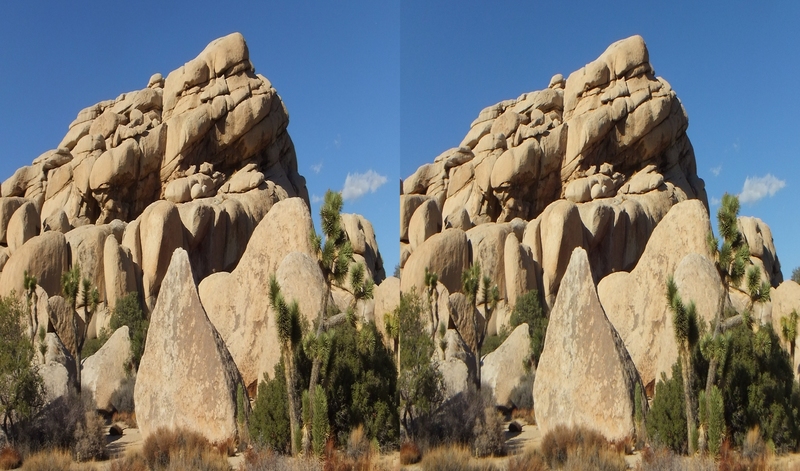 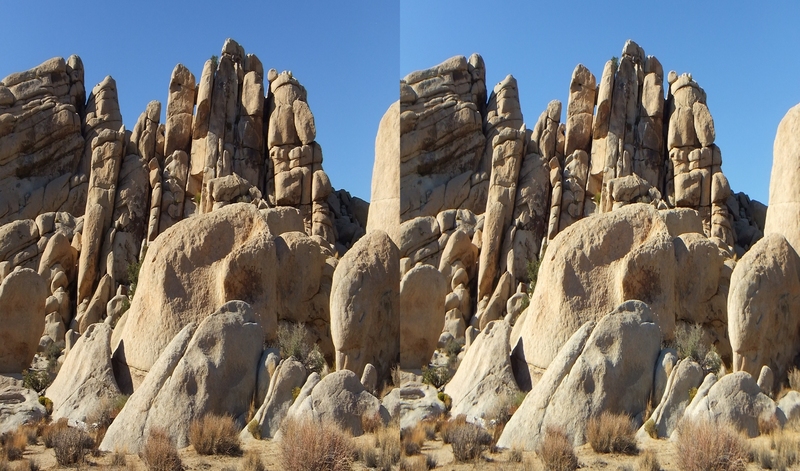 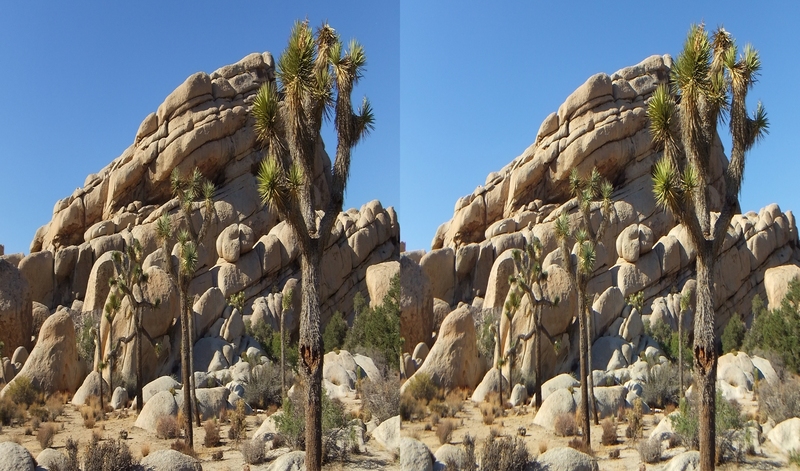 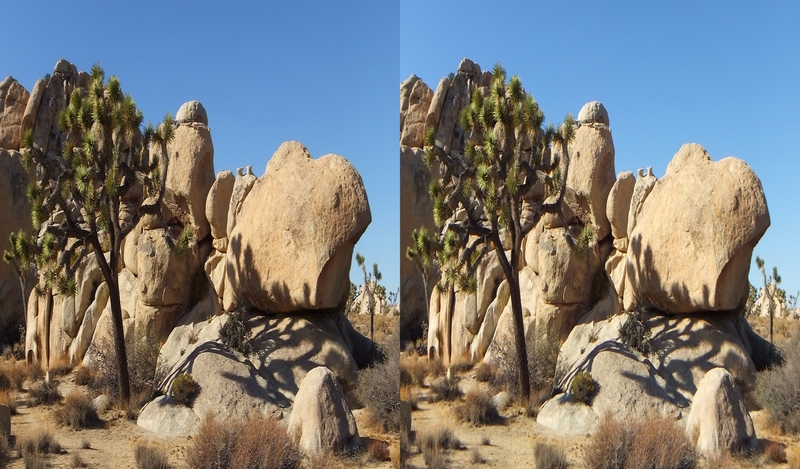 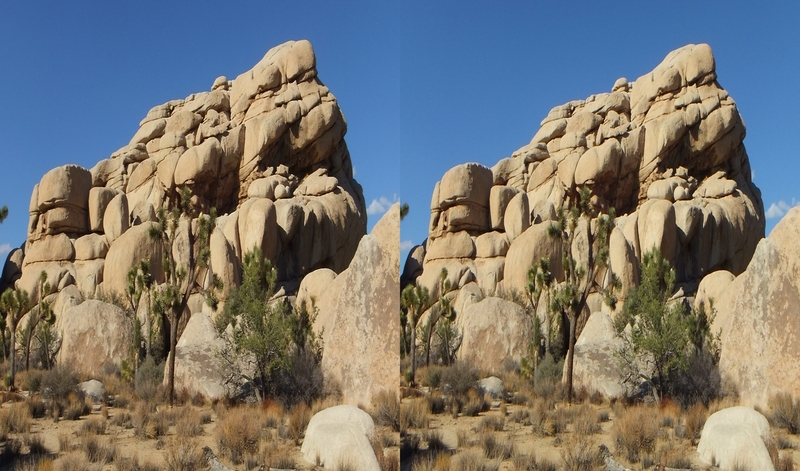 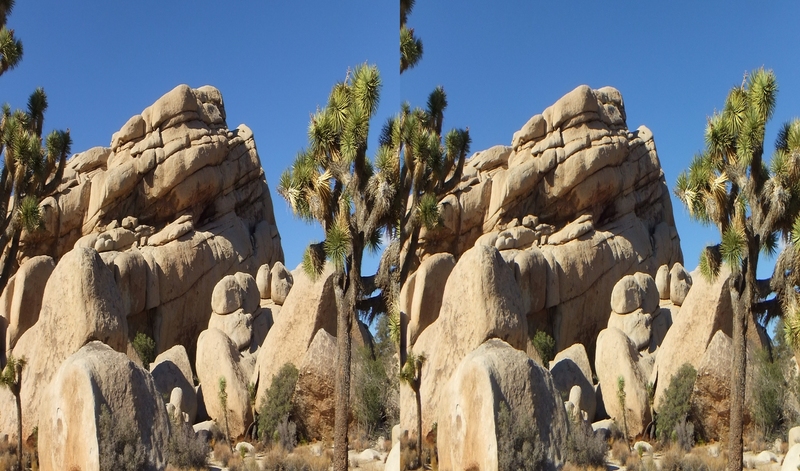 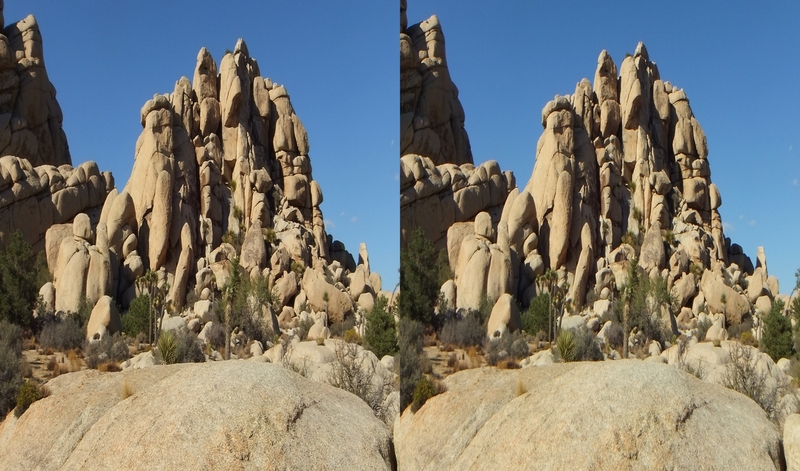 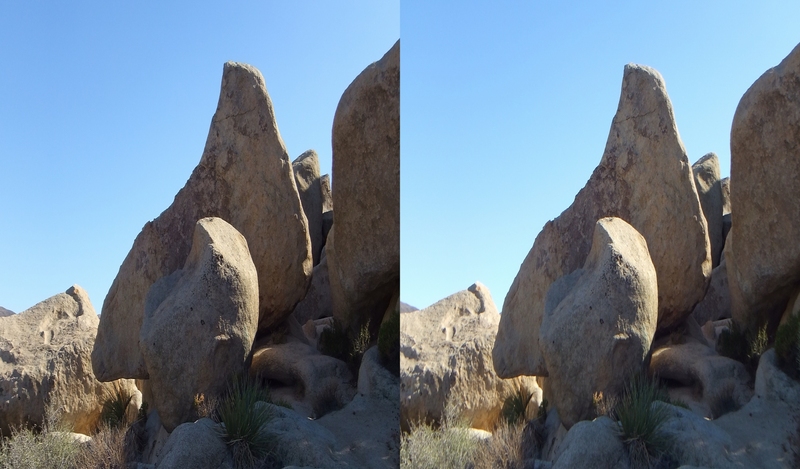 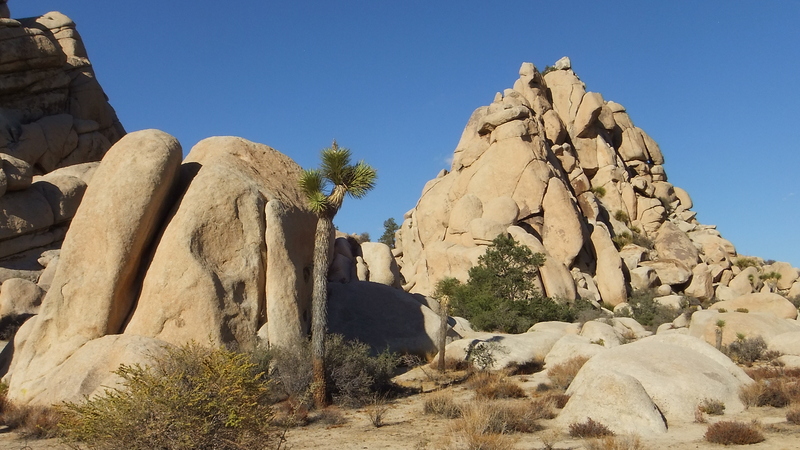 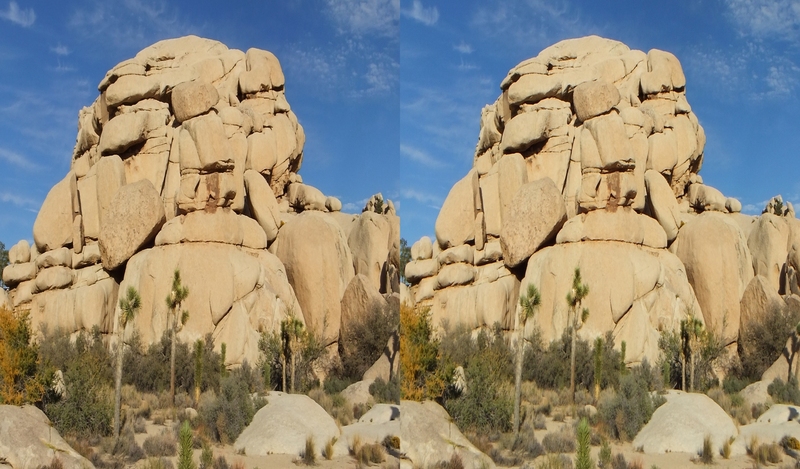 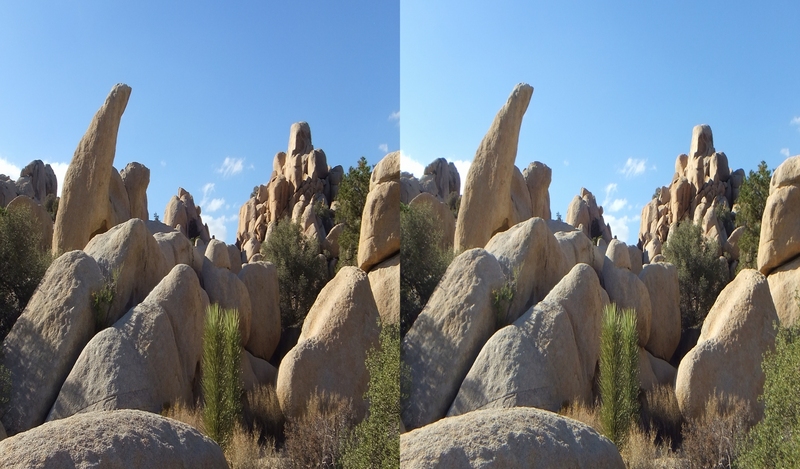 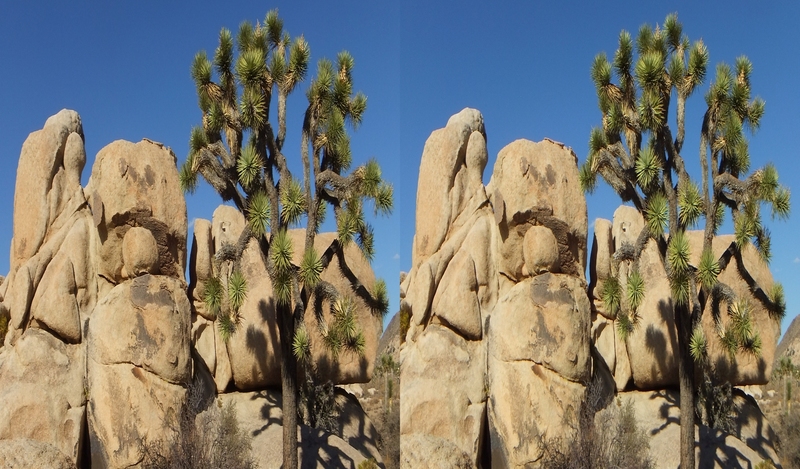 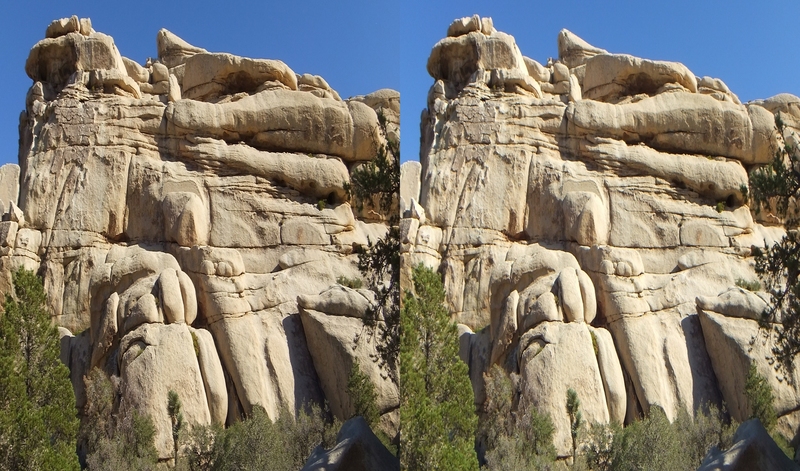 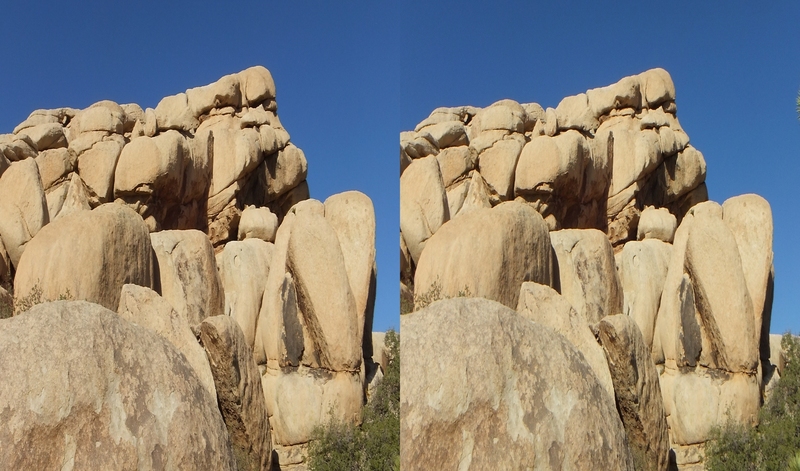 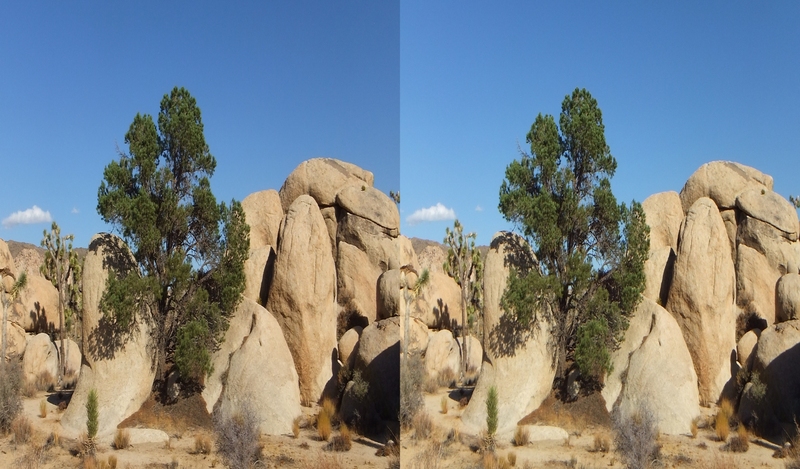 Dominating Hidden Valley’s large parking lot is “Turtle Rock” with a jumble of small peaks and boulders behind, known collectively as Turtle Rock Bouldering. 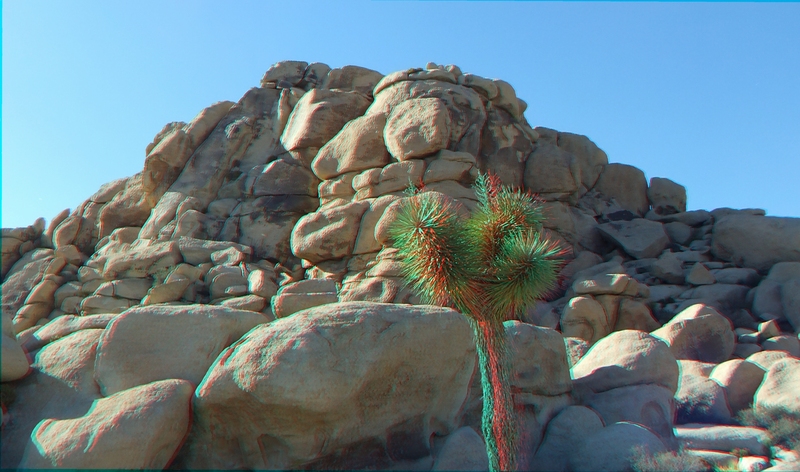 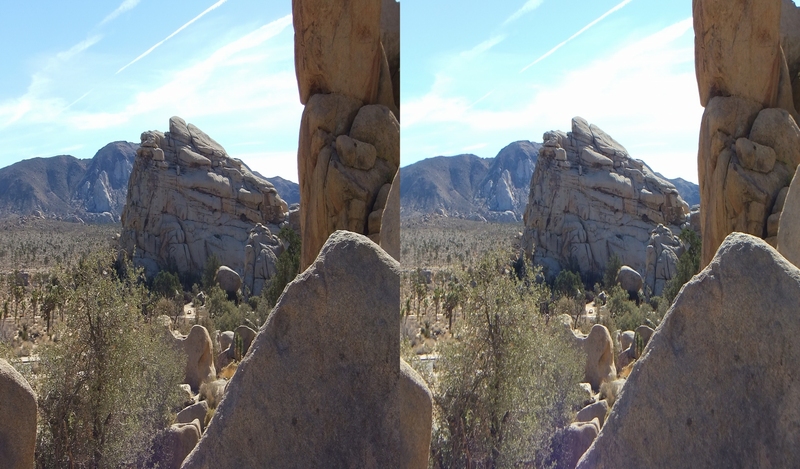 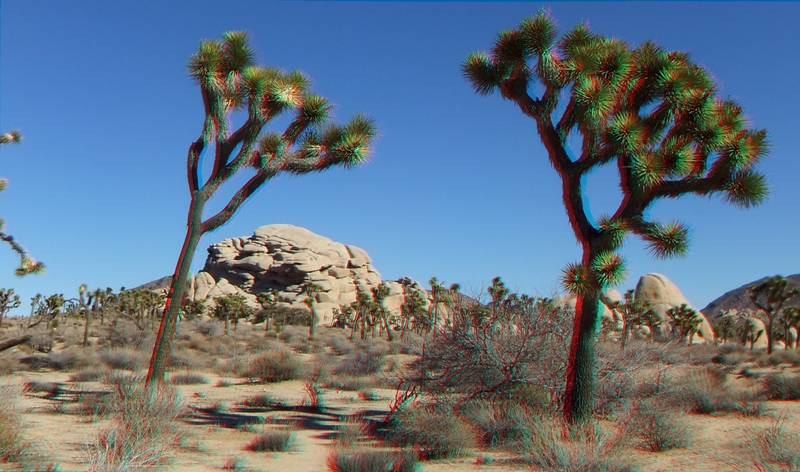 You are invited to download the 3D Anaglyph and 3D Half Side-by-Side photographs. 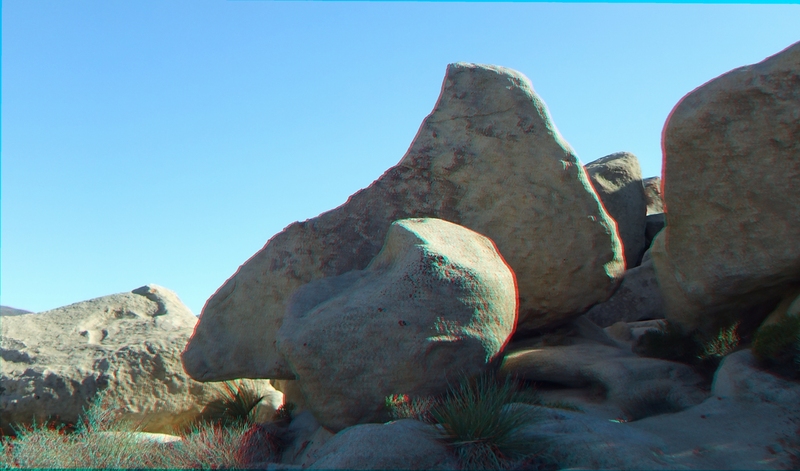 Share them with friends. 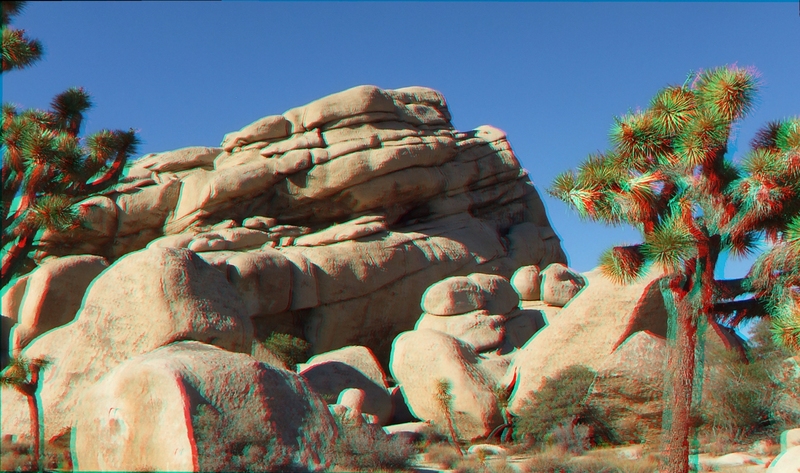 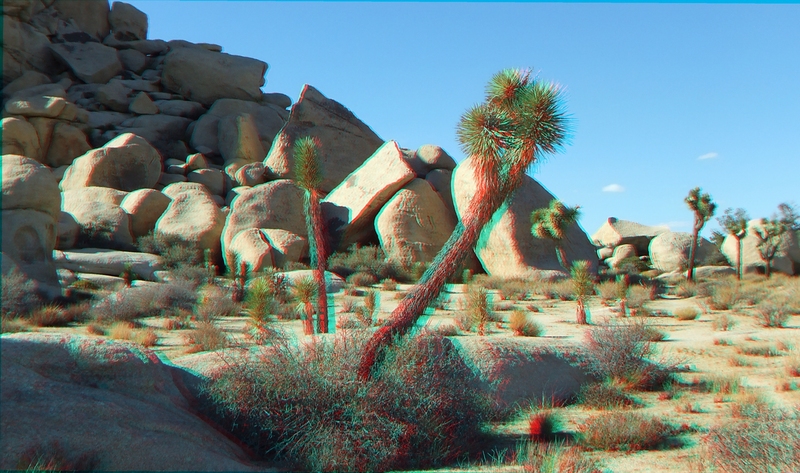 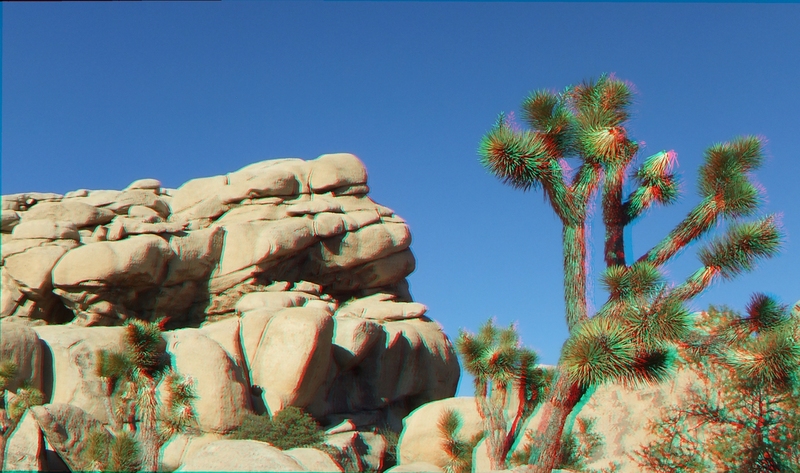 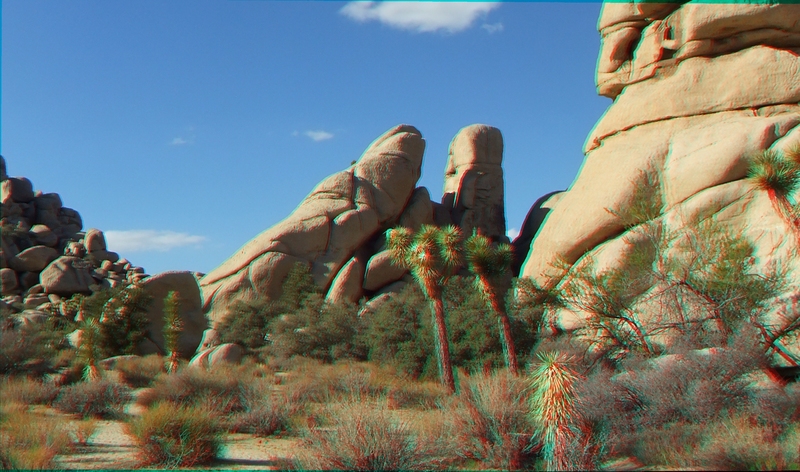 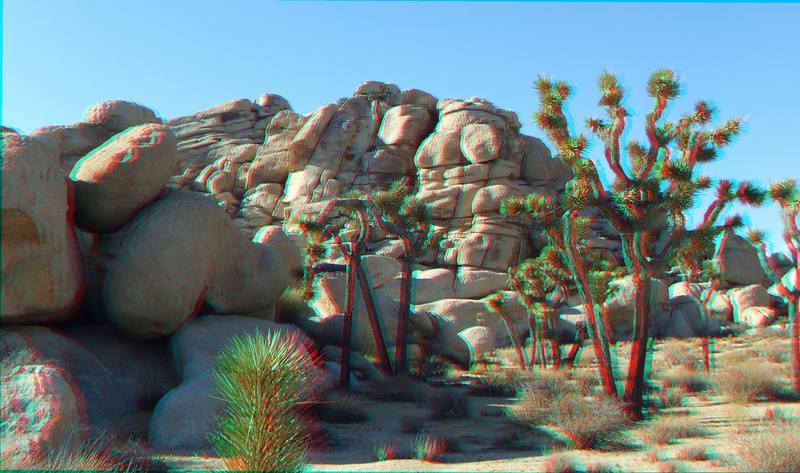 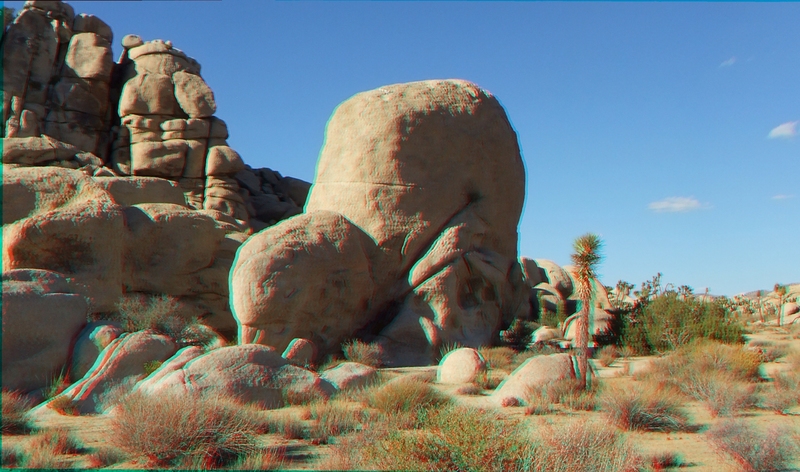 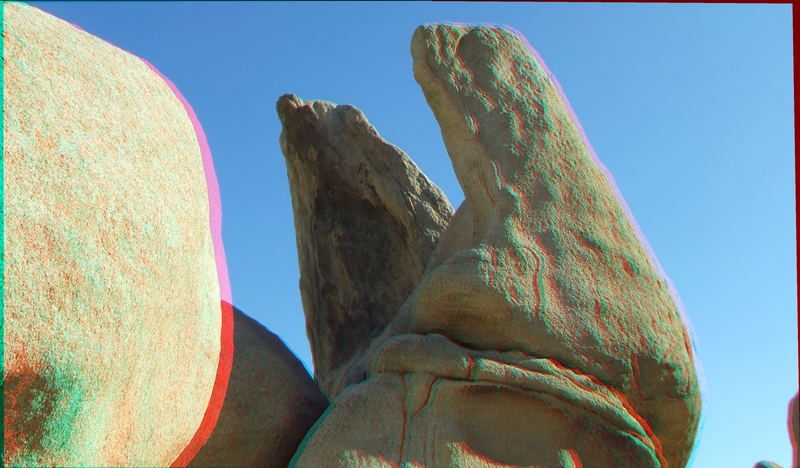 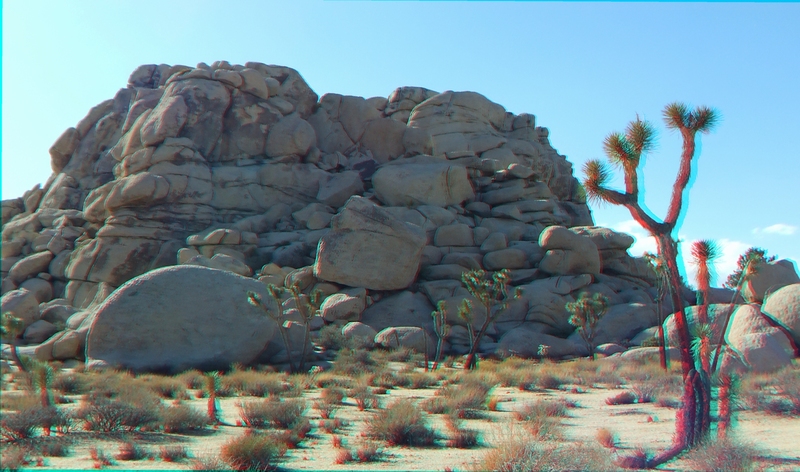 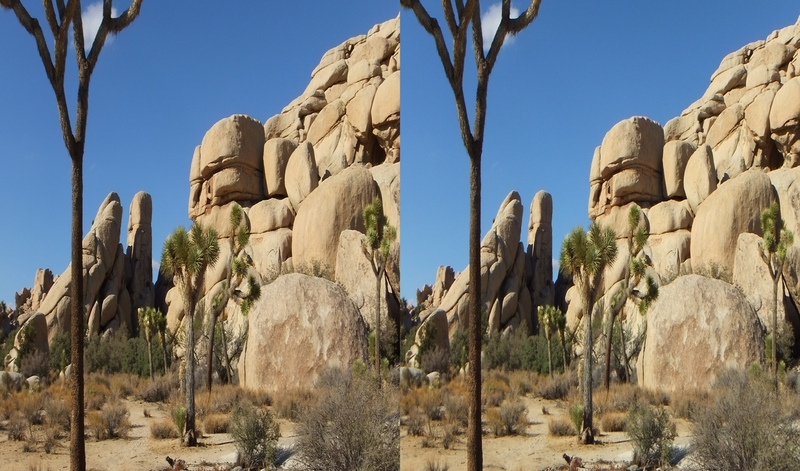 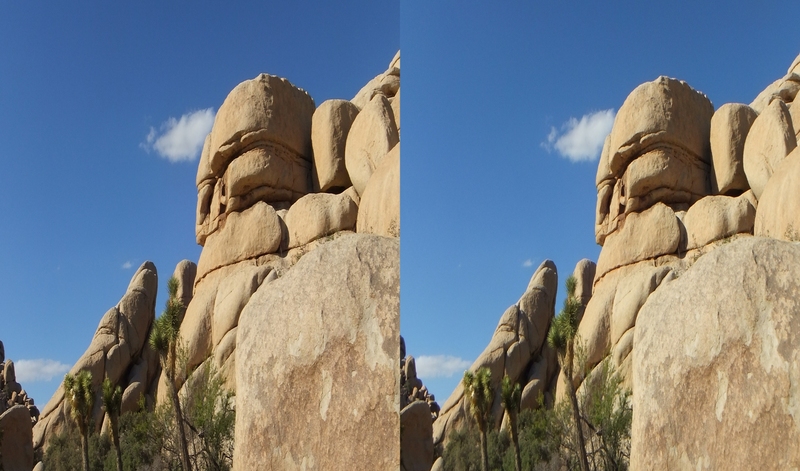 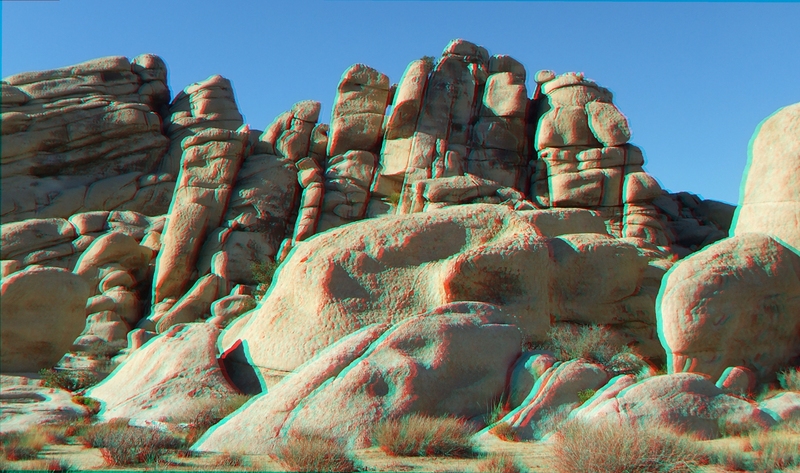 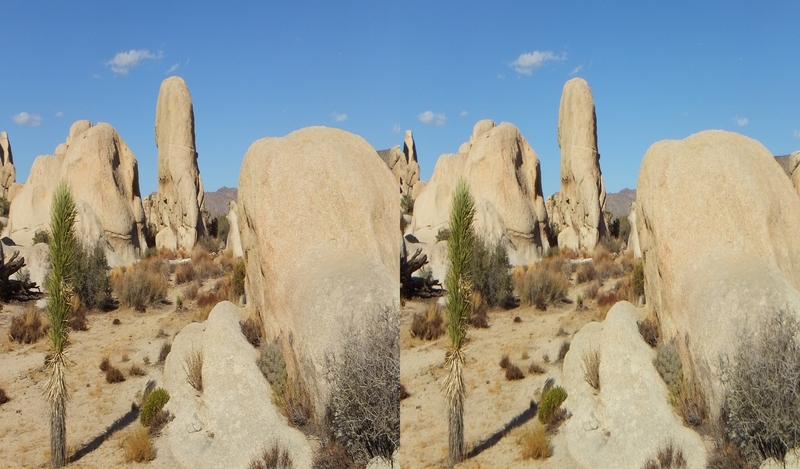 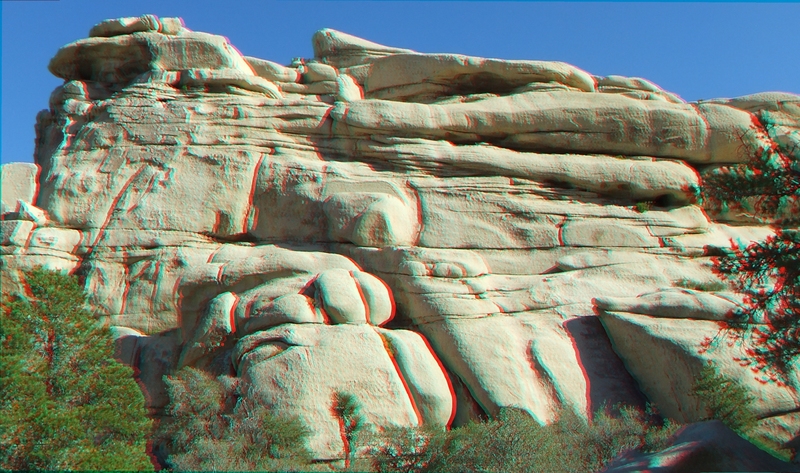 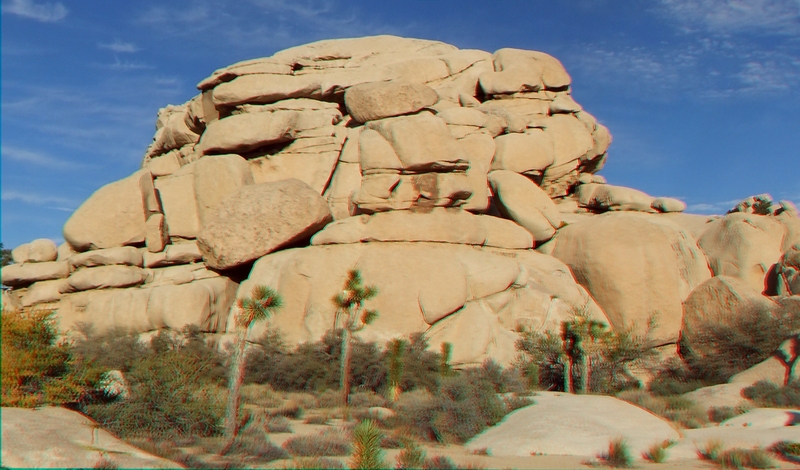 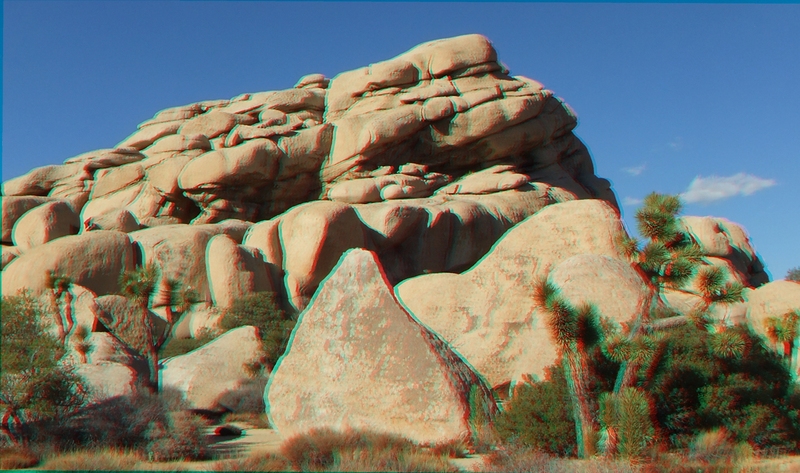 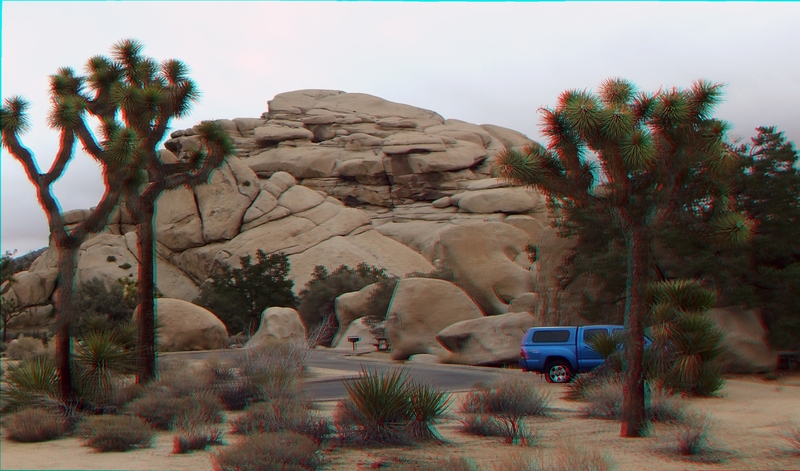 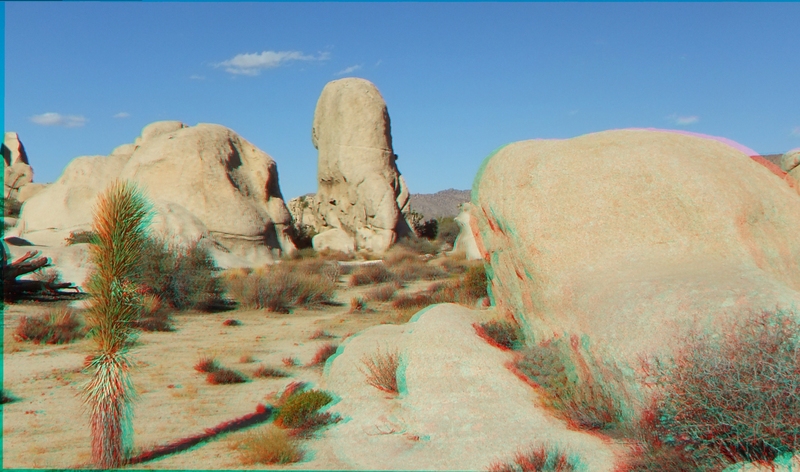 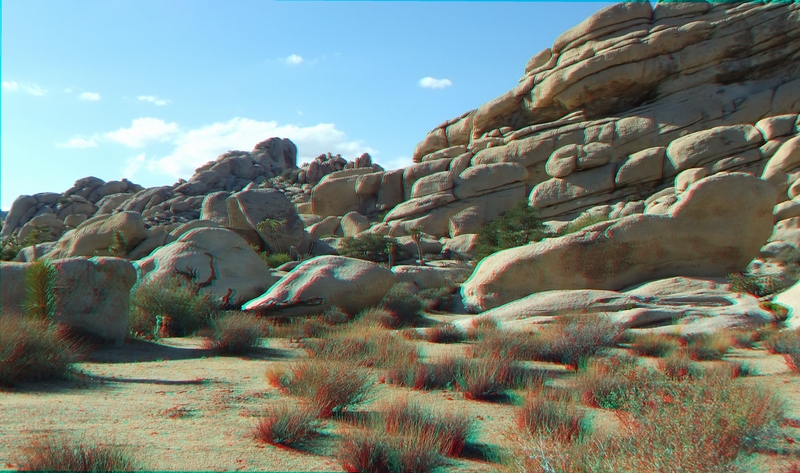 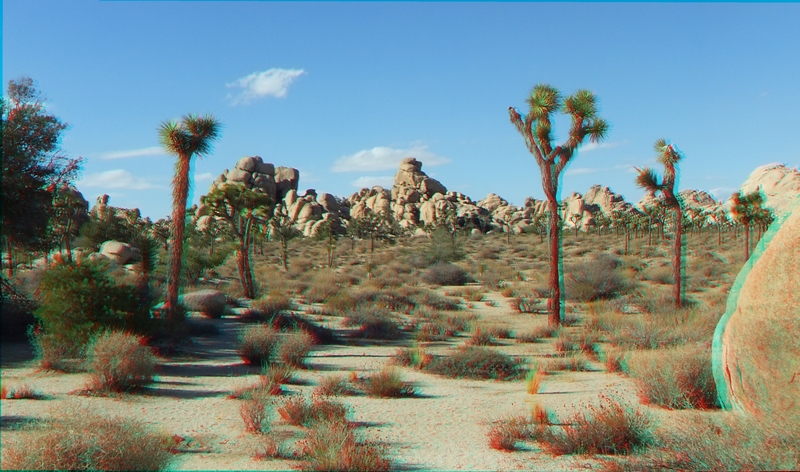 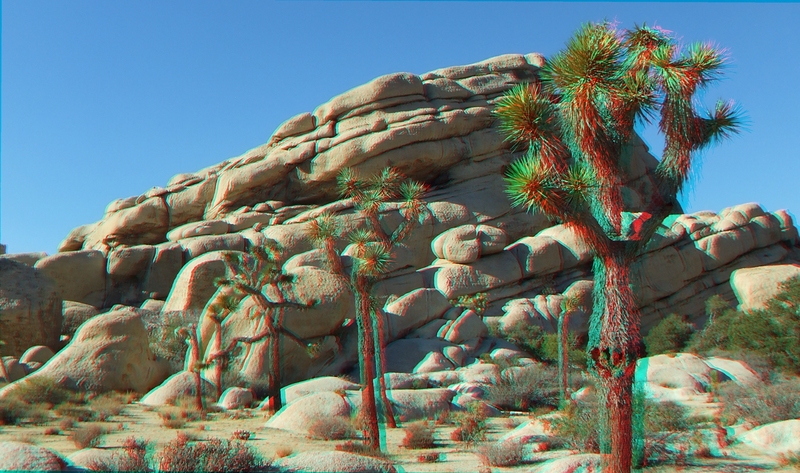 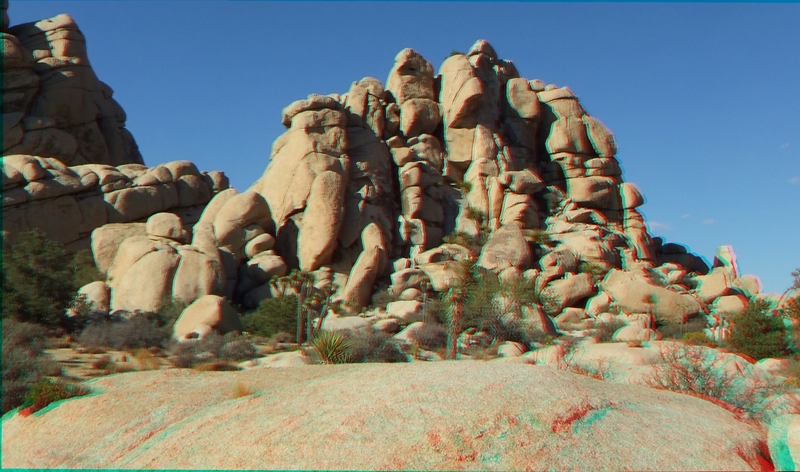 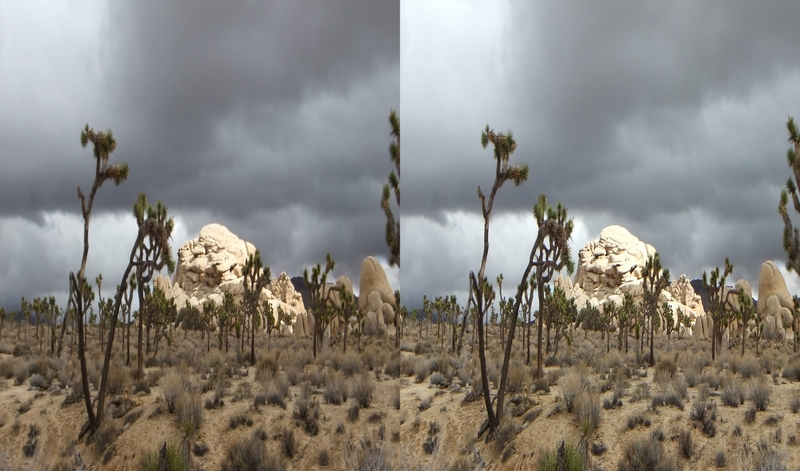 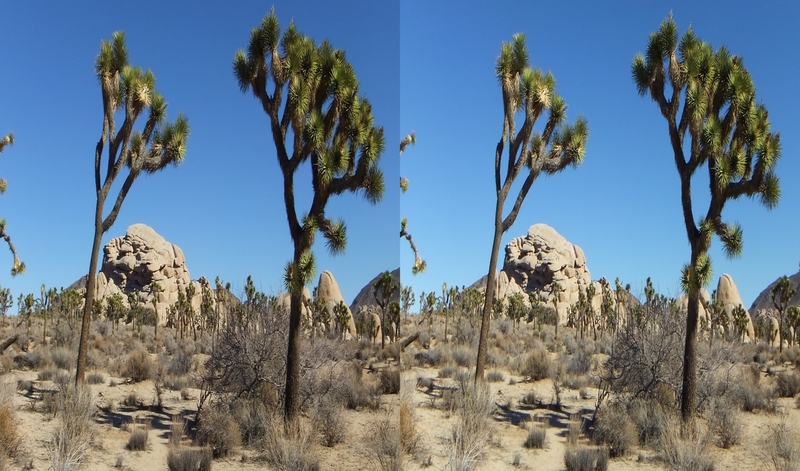 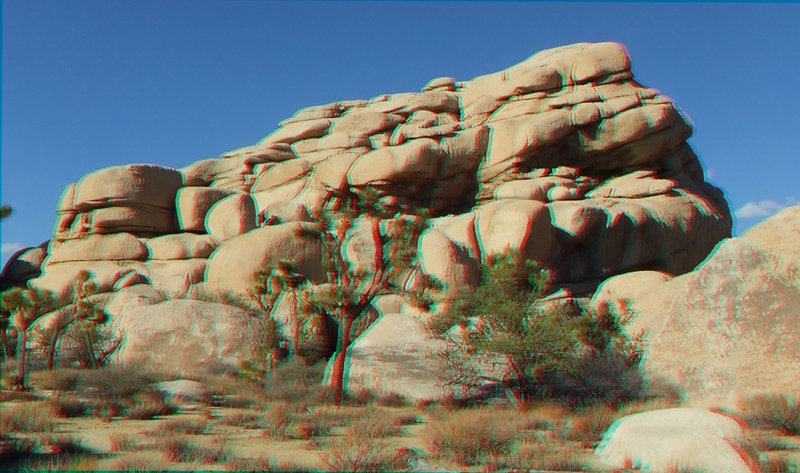 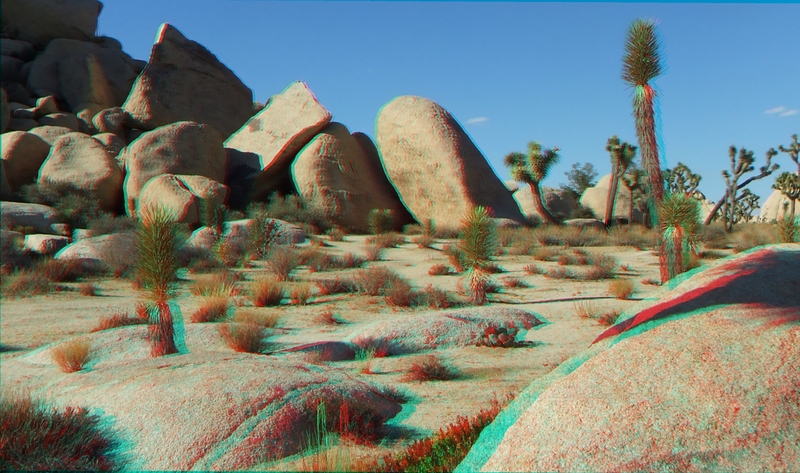 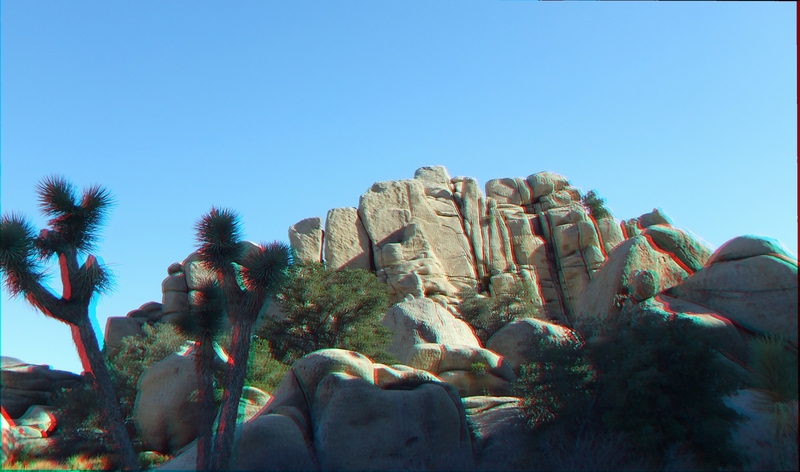 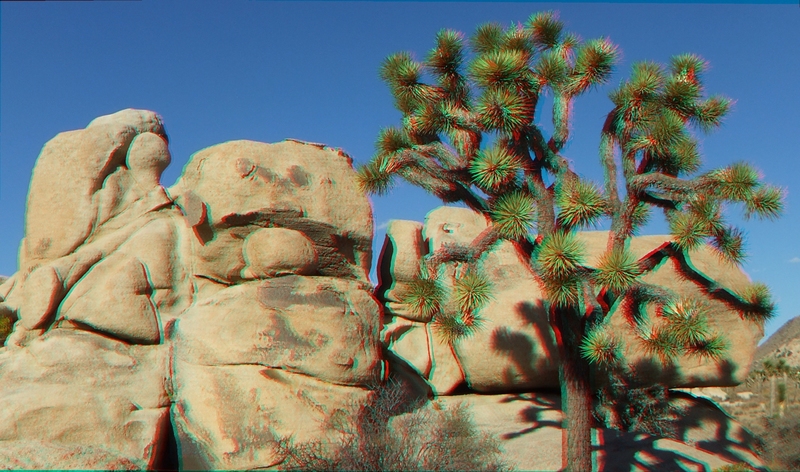 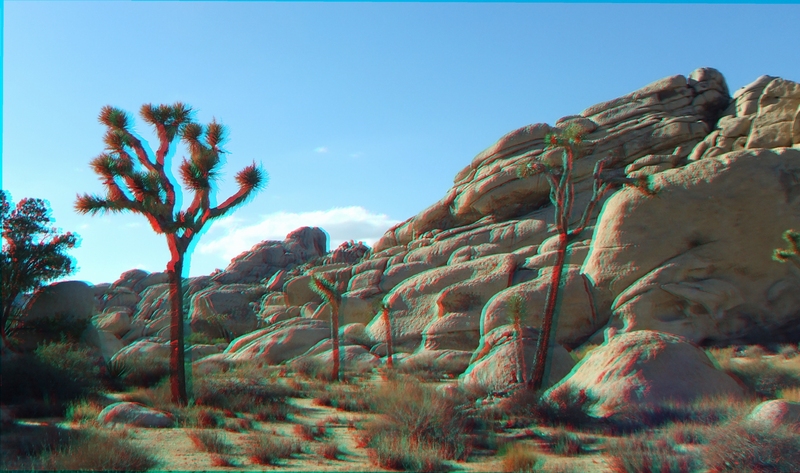 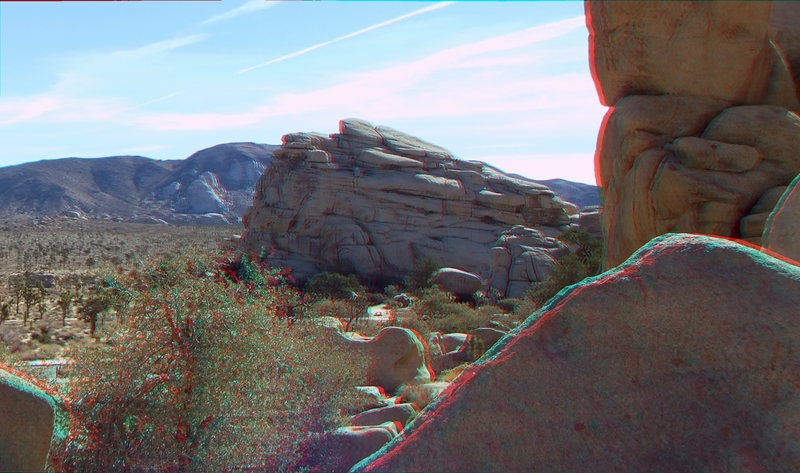 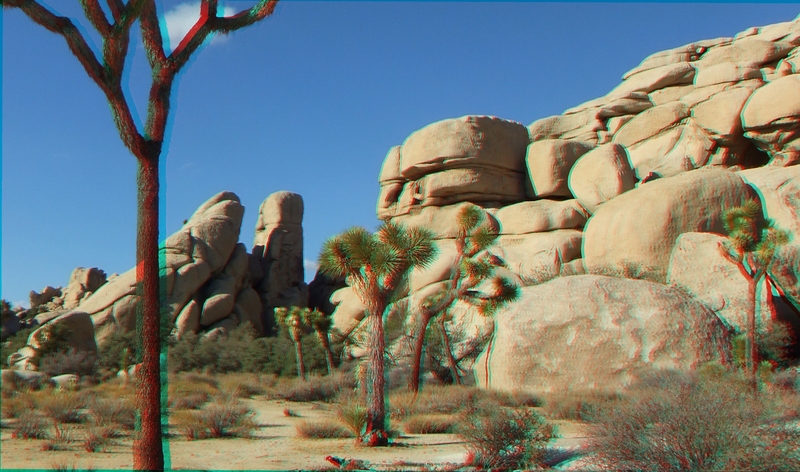 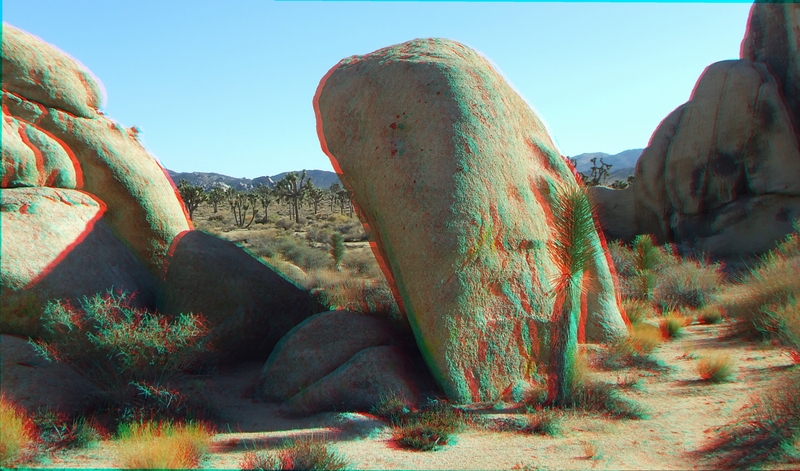 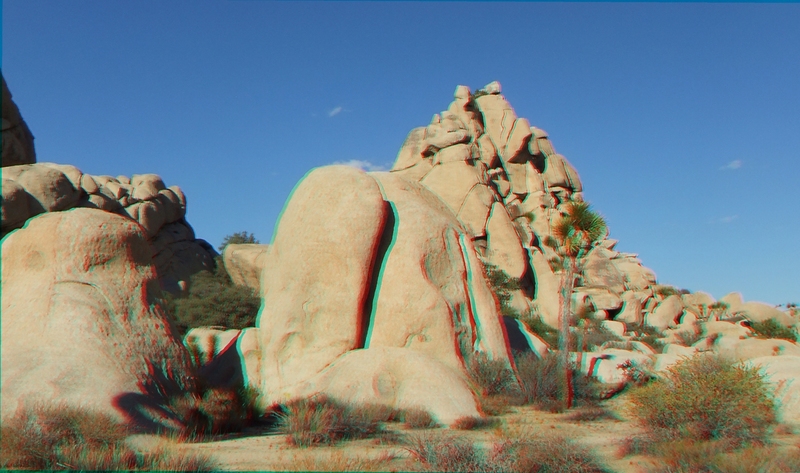 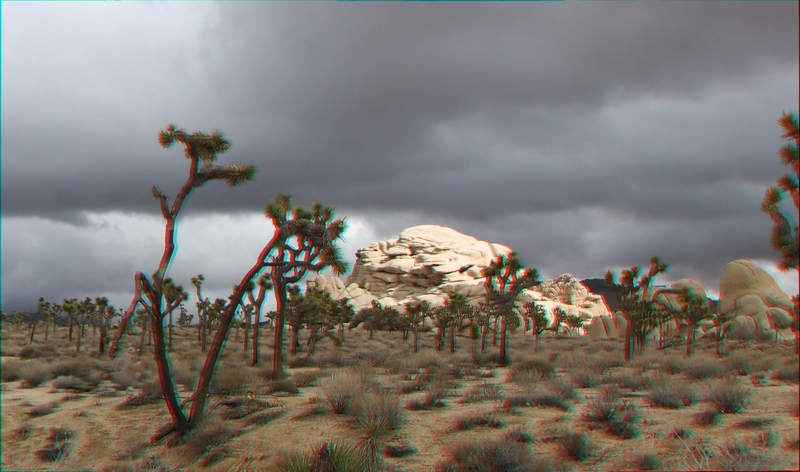 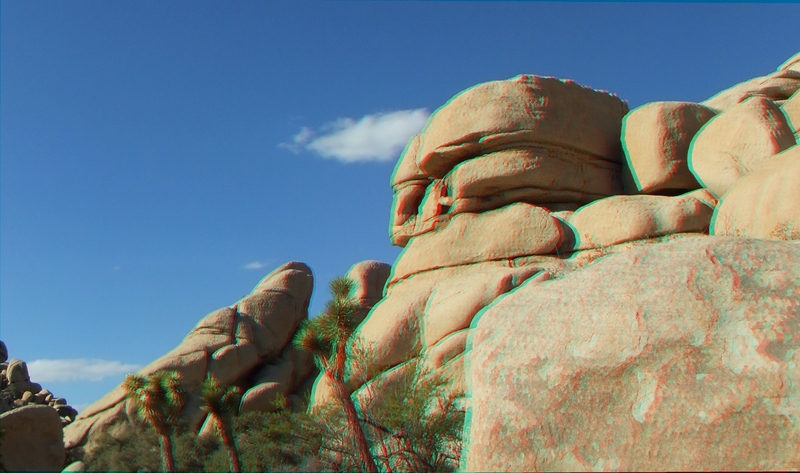 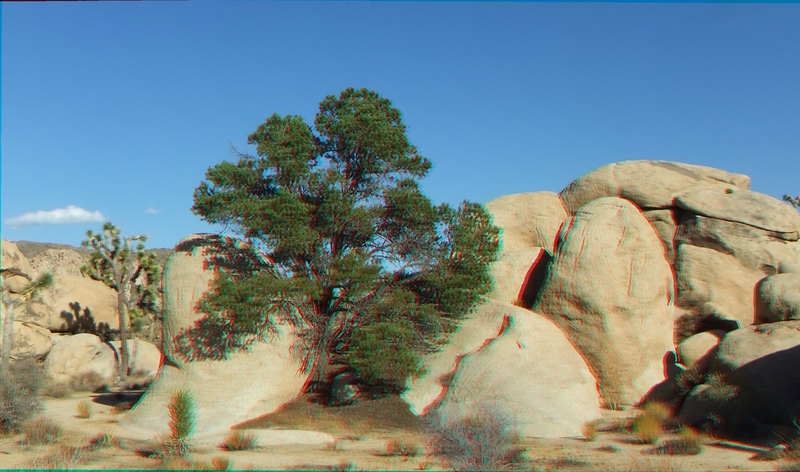 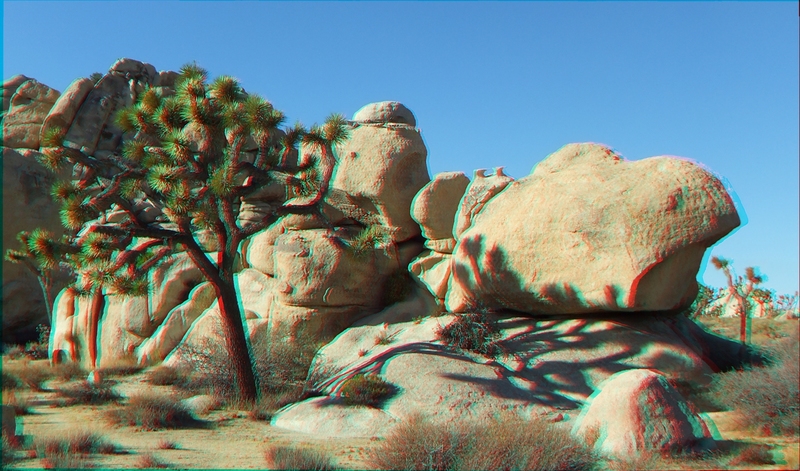 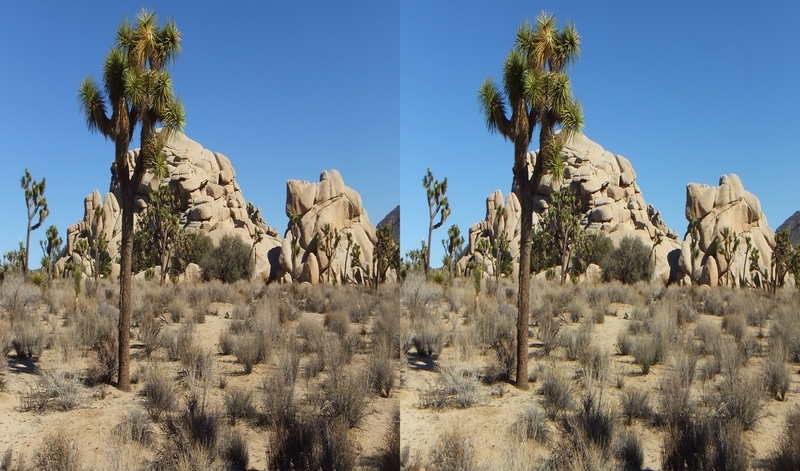 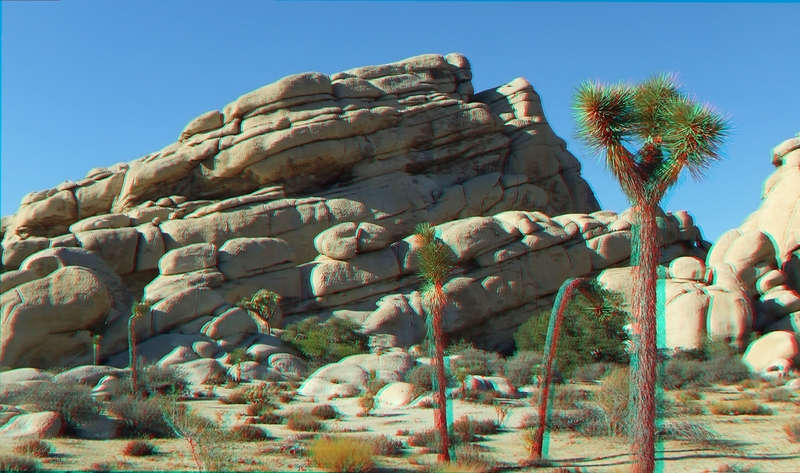 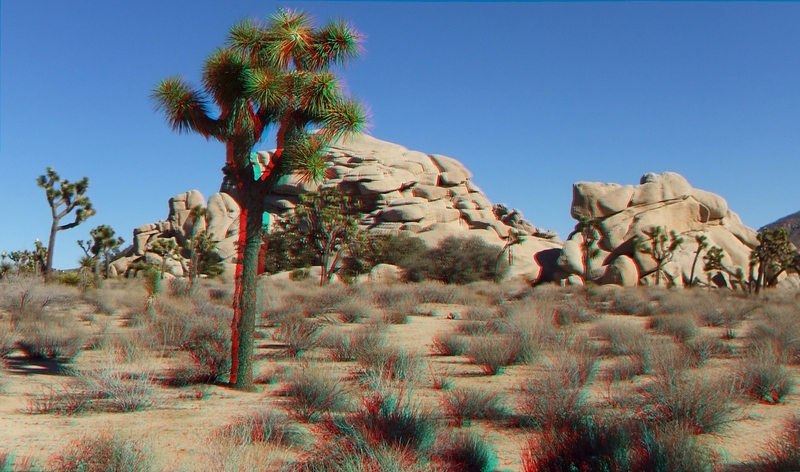 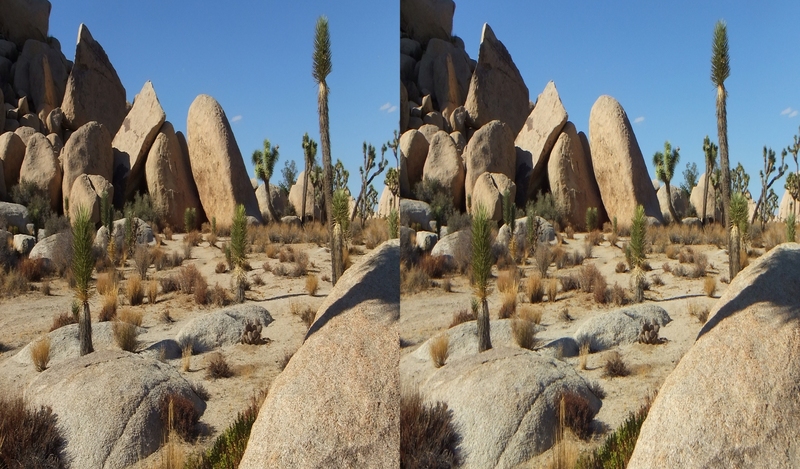 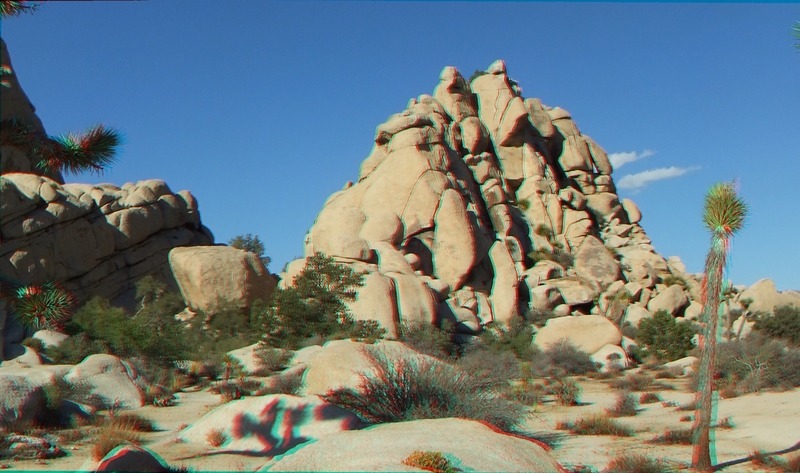 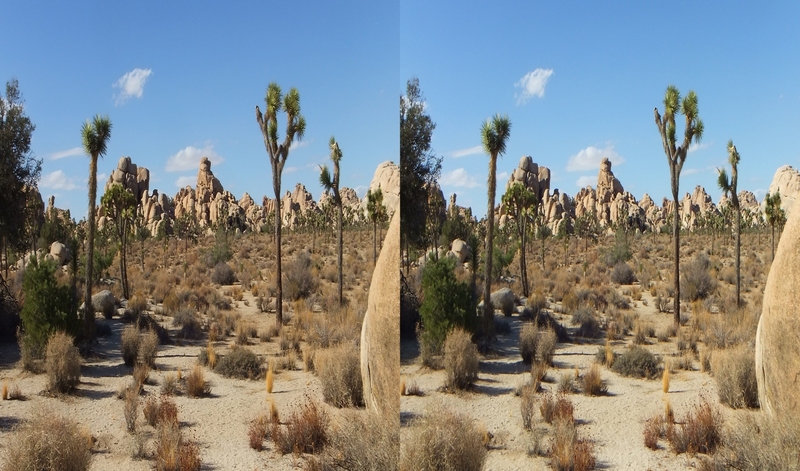 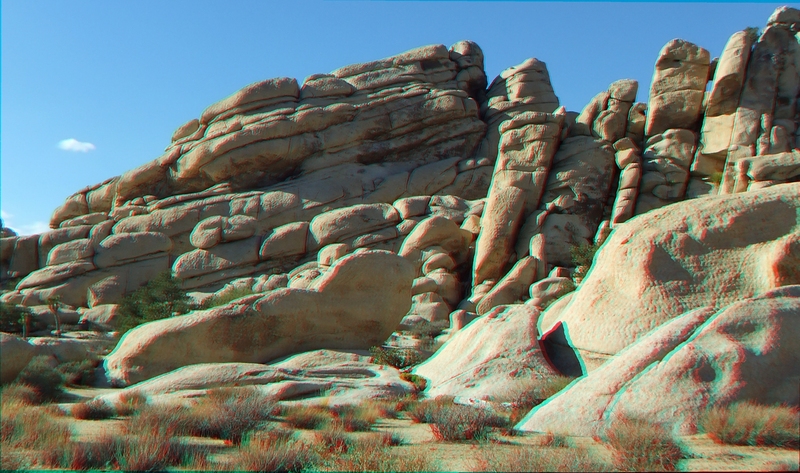 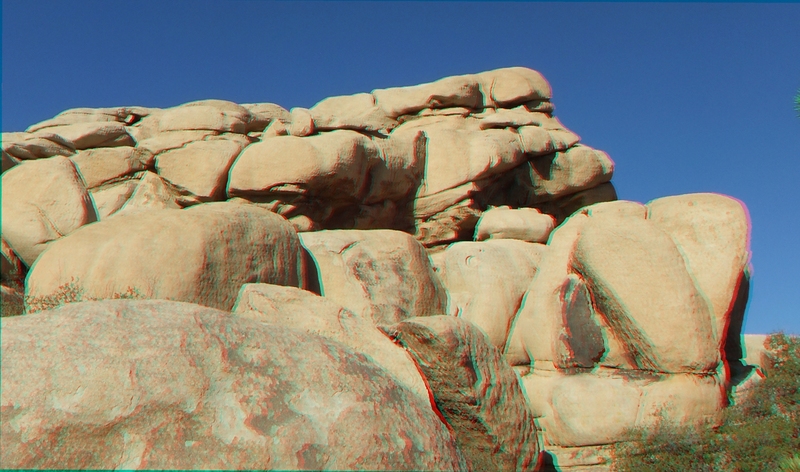 If you have a 2D television, you may view the 3D Anaglyphs on it using the red-cyan glasses. 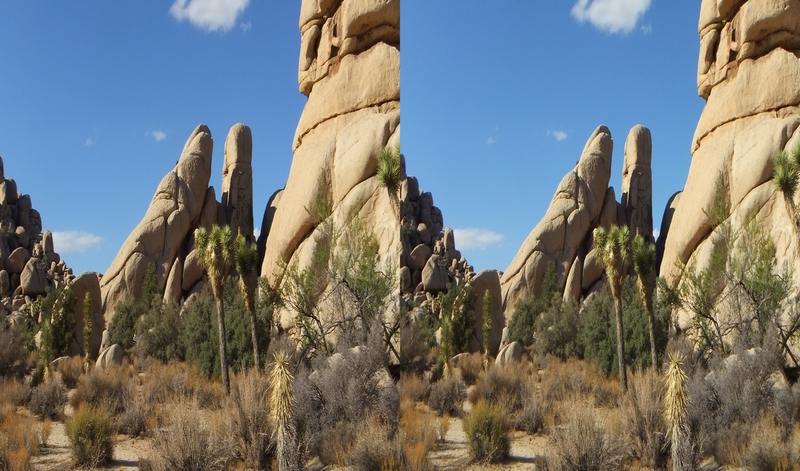 Copy the image files to a USB flash drive (thumb drive) and insert it into the USB slot on your television to view the JPG photographs. 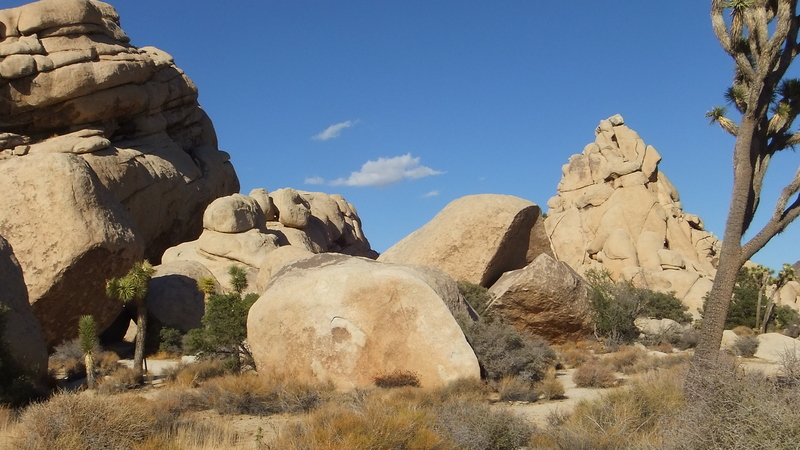 Thank you for visiting the Turtle Rock, Hidden Valley page. 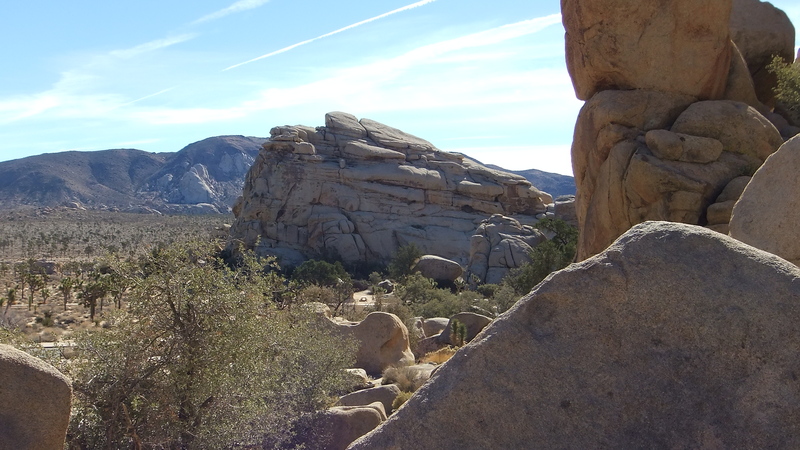 This is a popular picnic spot that has nooks, crannies, and caves to explore, as well as (on the south side) an historic Native American pictograph site.